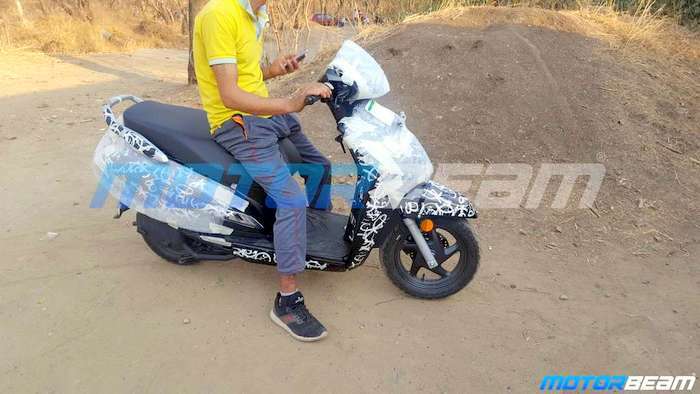 Recently, spy shots of the upcoming Honda Activa 6G were leaked online. Rumours suggest that it will be launched during the festive season this year. Honda Activa 6G was recently spotted testing under heavy camouflage. It is expected to don major visual and mechanical changes onboard, which are quite evident from the spy shots. Fresh reports suggest that the updated scooter might be launched in this festive season. There are minor possibilities of it being tested with BS-6 engines since it was spotted near ARAI office in Pune. The Activa 5G was launched back in February 2018, at the Auto Expo. Despite receiving any major design changes since the second-generation, it still remains the best selling scooter in India. Honda Activa 6G has been spotted testing with telescopic forks for the very first time. Till now, it used the awful unit linked suspension at both the ends. The new suspension will improve the overall handling. The scooter will sport newly designed LED headlamps and LED DRLs. The body and design changes are also quite evident, as it seems to look more like the Activa 125 now. Furthermore, Activa 6G will get an optional front disc brake, as seen on the spy shots. Otherwise, the Combined Braking system will be offered as standard fitment. As said earlier, the spotted Honda Activa 6G might be equipped with a BS-6 engine, ahead of the safety regulations. The emission norms are scheduled to kick in from April 2020, and all the automotive brands have already started testing for it. The BS-6 engine will also get fuel injection system. FI system will help the engine to keep the emissions in control and deliver a better performance. However, the mileage might go down. It will carry over the features from the Activa 5G like the four-in-one lock, LED headlamps, USB port and the front hooks. Although, the spotted test mule gets a revised speedometer too. With this, the prices of new Activa is expected to increase by nearly Rs 5000. Currently, it goes for Rs 54,206 to Rs 56071 (ex-showroom Delhi).